Imagine teaching table manners without the nagging and prodding. 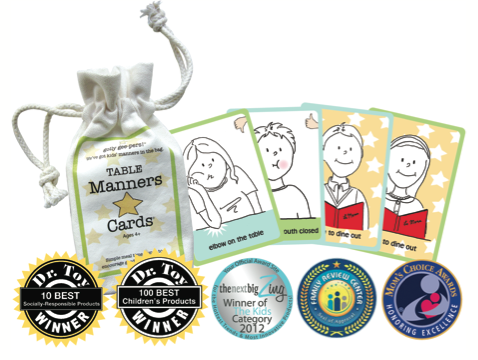 We did and came up with one deck, two games and numerous applications for these humorous but respectful, table manners cards. • motivate the entire family through friendly competition and reward. • provide engaging fun with purpose. • the durable, laminated cards and convenient drawstring bag. • the special “Note to Parents” card providing suggestions for maximizing the games’ success. • access to our website where customers can find free downloadable sticker charts and coloring pages. • the customizable blank thumbs-up and thumbs-down cards. • it comes in an eco-friendly 100% cotton, washable drawstring bag. • Recommended for ages 4 and ups. Table Manners Cards can be used for any number of people and can be used at home or while eating out, or even at family get-togethers. The cards are small enough to be practical at the table or can be to be tossed into a bag when on the go to grandma’s or a restaurant. They make dining in or dining out fun as well as a great learning tool to teach young children and older ones as well what good table manners are, and how to use them properly. A great tool for teaching, but also fun for everyone. Instead of a lecture on good manners, play a game! Great for families of any size!